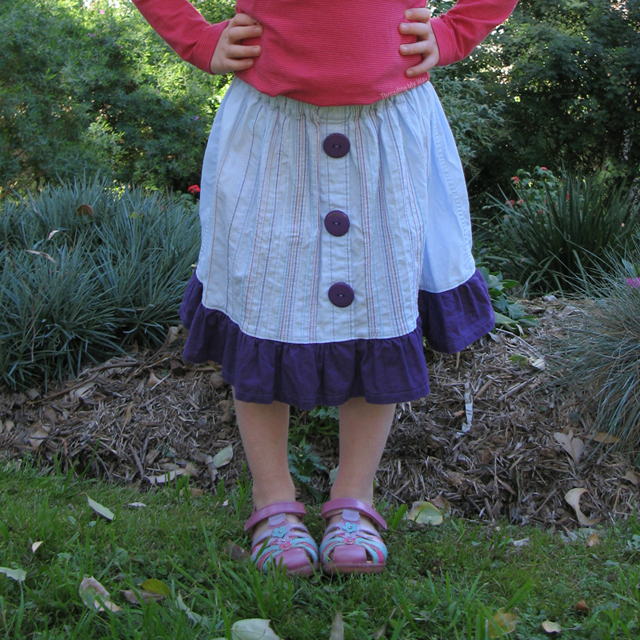 Take a man's shirt, add a ruffle and a few buttons and you have a cute, little girl's skirt. 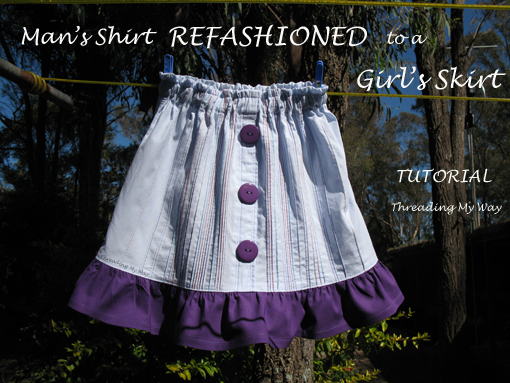 This tutorial will show you just how easy this refashion is. I used a man's cotton dress shirt, buttons from a woman's cardigan and some fabric from my stash for the ruffle. The front of this shirt has rows of pintucks sewn with different coloured threads. They only show on the inside of the shirt. The outside of the shirt shows the pintucks as seams. I want to feature the pintucks, so I am turning the fabric around and am using the inside of the shirt as the outside of the skirt. 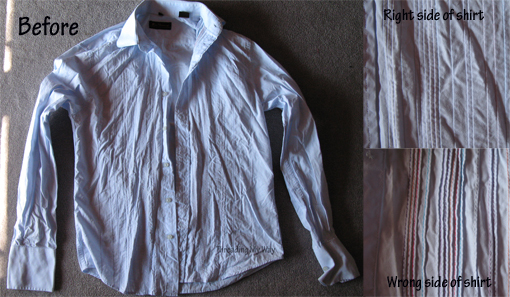 The seams on the shirt are flat felled, so both sides look OK.
You will need to take two measurements before you begin. Cut the shirt at the underarm. 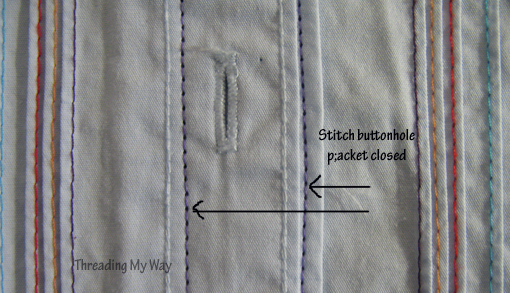 Stitch the buttonhole placket closed with two rows of stitching. I have used a contrasting coloured thread to fit in with the coloured threads on the pintucks. Turn under 1/4" and press or stitch. Stitch as close as you can to the hem of the casing, leaving a 2" opening to feed the elastic into. Sew another row of stitching 1/2" from the top of the skirt. I cut the elastic about 1" to 1.5" shorter than the waist measurement. Feed the elastic into the casing through the opening, making sure you leave the end sticking out of the opening. Remove the safety pin and stitch the elastic ends together. Overlap about 1". Spread out the elastic so it is even all the way around. Sew through the casing and elastic at the side seams. This will prevent the elastic from twisting in the casing. Decide how wide the ruffle will be. Cut the skirt to the desired length. Cut extra for seam allowances and hem. Cut the ruffle 1.5 to 2 x the width of the skirt. Mine is 1.5 x the width. Join the short ends of the ruffle to form a tube. Neaten edges. Do NOT backstitch and leave the threads hanging. Sew a second row of stitching 3/8" from the edge, going from the second side seam back to the first side seam on the ruffle. Mark the centre front and centre back of the skirt. Mark the centre front and centre back of the ruffle. With right sides together, pin the ruffle to the skirt at the side seams, the centre front and the centre back. Pull the two bobbin threads and move the fabric towards the centre front. Pull until the fabric is the same length as the skirt. Tie a knot in the two bobbin threads. Even out the gathers and pin. Repeat three times pulling the threads from each side seam to the centre. 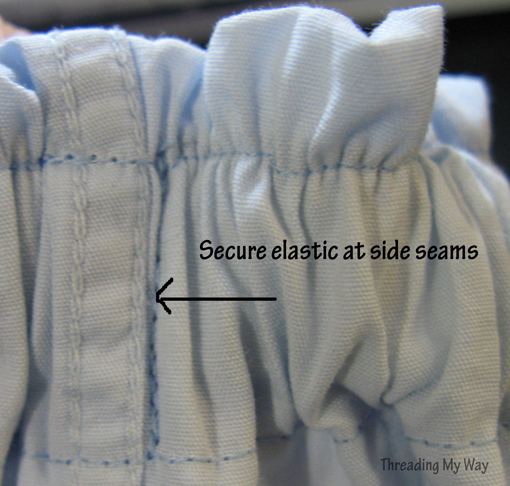 With needle and thread, sew the ruffle to the skirt, with long stitches (hand basting stitch). Sew between the two lines of machine basting. Remove both rows of machine basting (bobbin and upper threads) and the hand basting. Neaten the edges by overlocking (serging) or zig zag. Sewing two lines of machine basting, makes it less likely for the thread to break as you pull the gathers and it also makes it easy to sew over the gathers so they remain neat. 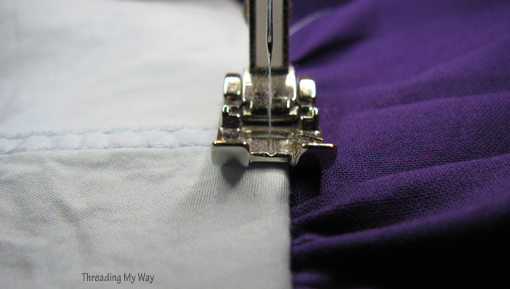 Press the seam towards the skirt. 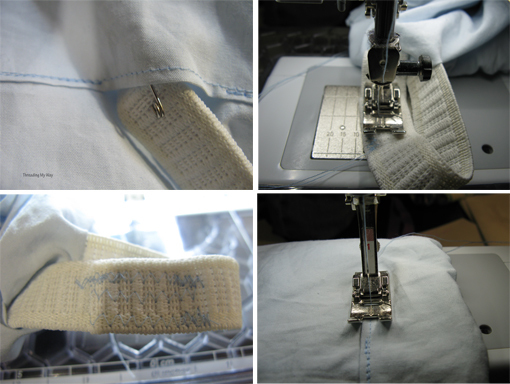 Set machine stitch slightly longer than normal. My topstitching is 2.8. 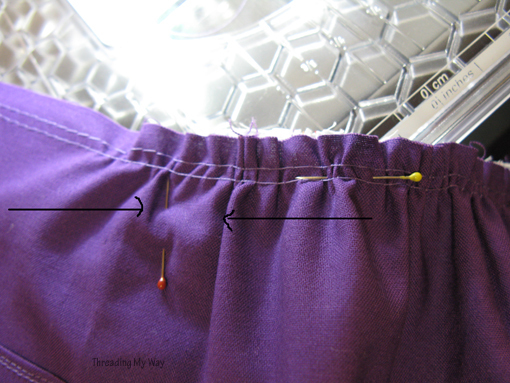 On the right side of the skirt, sew a row of stitching about 1/8" from the seam. This will hold the seam in place and gives a nice finish. Turn under 1/4" and either press or stitch. Turn under 1/2" and stitch. As they are only decorative, I have chosen buttons which are obviously larger than the original buttons. These buttons came from a pre-loved cardigan, which is now in the dress up box. Sew the buttons onto the buttonhole placket, covering the buttonholes. Thanks for all the input on my post about inches or centimetres. The measurements in this tutorial are not critical and can be varied. I'll write a separate follow up post. In the meantime, here's a link to an online converter. I'm adding this skirt to our Skirts for Girls link party. Oh this is so cute! I've seen a lot of mens shirt to skirt refashions but most of them still end up looking like a shirt, but this doesn't it's totally cute!! Thanks, Kate. That's exactly what I wanted... to use a shirt, without it looking like a shirt. Really lovely! Have a nice day! Super cute! I love how you used the wrong side of the fabric, too. SO cute! I love this skirt, I might have to make some for my girls! I'd love to see them if you make any.. So cute! 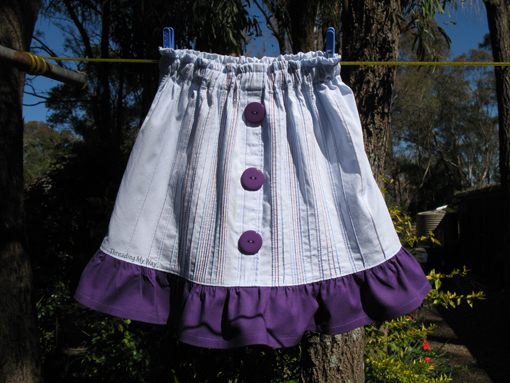 I wish I had a little girl to make this skirt for! This is a clever idea, and your instructions are, as always, well written, so I'm pinning this to make once I can convince hubby to pass on an old shirt! Wow, What can I said!! I love your proyect, this transformation is fantastic, you'll never cease to marvel us with your creations. Thanks for sharing your tutorial with us. You did a beautiful job!!!! Pam, I forgot to tell you that I pin it your project, to my sewing board on Pinterest! Gorgeous Pam! The ruffle and buttons really make it! That is sooo cute!!! I love the buttons! Oh my gosh, that skirt is just too cute! I love how you reused a shirt to make it. Thanks for sharing at The Fun In Functional! I love this shirt refashion Pam! Great tutorial! super cute! I keep seeing these on pinterest and want to try one. what is the size range? Is this a toddler skirt...or could it be made for size 8 and up girls? I also suspect it depends on the size of the mens shirt???? Depends on the size of the original shirt, as to whether the skirt will fit. You may need an XL to fit an 8yr old. Take the hip measurement of the child. As long as the width of the shirt is more than the hip measurement you will be alright, as far as pulling the skirt on, but extra width is needed for gathers. Ideally, you want 1 and 1/2 to 2 times the waist width for full gathers. 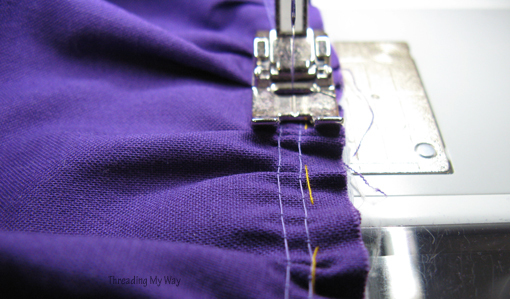 If you don't have enough width, you can always add an insert at the side seams, using fabric from the sleeves. To add extra length, vary the width of the ruffle. This is such a good idea! I love the ruffle and the buttons...it adds a cute girly element to it! Thank you so much for linking up at Artsy Corner! I hope to see you next week! Love this! I'm having so much fun exploring your site. I've pinned a few projects and liked you on facebook. wow it`s a fantastic tutorial....Thank you so much!